In the introduction of his book, “Outliers”, Malcolm Gladwell (of Tipping Point and Blink fame) describes the mysterious town of Roseto Pennsylvania as an example of an outlier. In 1882, a group of men left Roseto Valfortore (Valley of Roses), a town of 1300 located near the Province of Foggia in the Southern Italian region of Puglia and set sail for New York. As described by Gladwell, “For centuries, the paesani of Roseto worked in the marble quarries in the surrounding hills, or cultivated the fields in the terraced valley below, walking four or five miles down the mountain in the morning and then making the long journey back up the hill at night. It was a hard life. The townsfolk were barely literate and desperately poor and without much hope for economic betterment – until word reached Roseto at the end of the nineteenth century of the land of opportunity across the ocean”. The importance of all this for me personally is that one of these brave men was Nicola Rosato, my great-grandfather on my father’s maternal side. The men spent their first night in America sleeping on the floor of a tavern on Mulberry Street in Manhattan’s Italian neighborhood. After arriving in New York, the men eventually found work in the slate mines of Bangor Pennsylvania, but far from the opportunity they expected, they were confronted with prejudices as immigrants, tolerating substandard conditions, and often residing in homes that were nothing more than shacks. The Italians were considered uncultured and uneducated peasants who faced much discrimination especially in the field of employment. Finally, in 1887, Nicola Rosato, purchased land and built the first house. He had founded the town of Roseto Pennsylvania, naming it for his Italian village. Nicola’s son, Peter Rosato, was one of the four members of the incorporation committee which succeeded in incorporating Roseto as a borough in 1912. 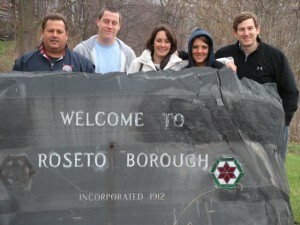 Roseto became the first 100% Italian borough in the USA. 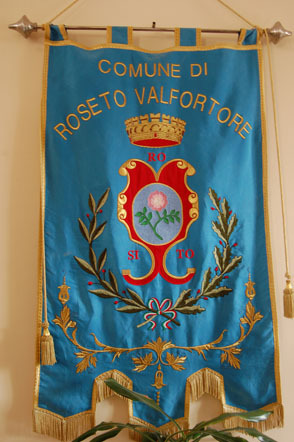 The town was largely settled by immigrants who followed the founders from their native Roseto Valfortore. One group of Rosetans after another packed their bags and headed to Pennsylvania. By 1894, 1200 Rosetans had applied for passports to America, leaving entire streets of their native village abandoned. According to Gladwell, Roseto Pennsylvania came to life. 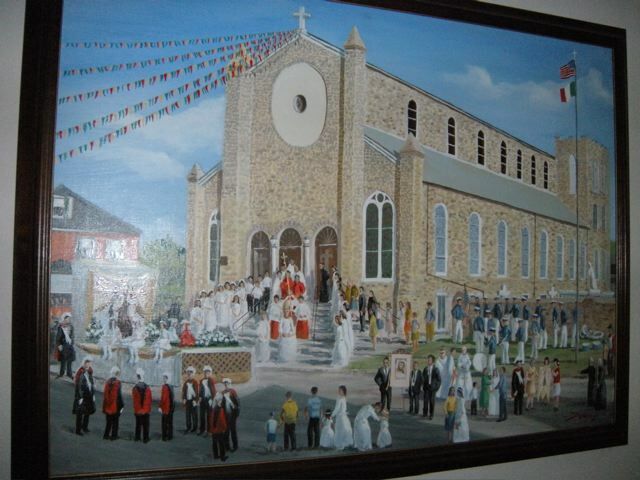 They built closely clustered houses; they built Our Lady of Mt. 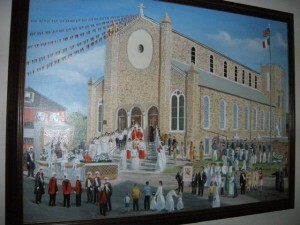 Carmel Church, and they named the main street on which it stood Garibaldi Avenue after the hero of Italian Unification. They set up spiritual societies and organized festivals. In every yard they planted gardens, raised pigs and grew grapes for homemade wine. They built schools, parks, a convent, and a cemetery. All the while, they opened family owned shops, bakeries, and restaurants. Everyone fought over bragging rights for the best wine in town. Only Italian was spoken in the early 1900’s – and not just any Italian, but the Foggian dialect. Roseto had become its own self sufficient world and probably would have remained so but for a man named Stewart Wolf. Wolf was a physician and medical school professor who spent summers on a farm not far from Roseto. Wolf was approached by a local doctor who told him he had been practicing locally for 17 years and he treated patients from all over the area not just from Roseto. He explained that he rarely found anyone from Roseto under the age of 65 with heart disease – notwithstanding that heart disease in the United States was an epidemic at this time, it being prior to the advent of cholesterol awareness and cholesterol controlling medication. Wolf, along with a sociologist named Bruhn, conducted a study and invited the entire population of Roseto to be tested. The results were astonishing. Virtually no one under 55 died of a heart attack; for men over 65, the death rate from heart attack was half that of the United States as a whole; and the death rate from all causes was 35% lower than it should have been. There was no suicide, no alcoholism, no drug addiction, and little crime to speak of. No one was on welfare and no one even suffered from peptic ulcers. These people died of old age. That’s it! There was a name for a place like this – a place that lay outside everyday experience, where the normal rules did not apply. Roseto was an outlier. The study concluded it was not diet related. The Rosetans Mediterranean diet was altered to some extent by the unavailability of products such as olive oil. Instead, the Rosetans cooked with lard, smoked heavily, and many struggled with obesity. The study also revealed that it wasn’t genetics and it wasn’t the specific location in Pennsylvania where Roseto was situated. It was Roseto itself. They looked at how the Rosetans visited each other on a daily basis stopping to chat or cooking for each other in the backyard. Extended family clans were the norm, with three generations commonly living under the same roof. There was an enormous respect commanded by the grandparents who were part of the clan. They went to Mass and saw the calming and unifying effect of the church. There were 22 civic associations in a town of less than 2000 people. The Rosetans had created a social structure which insulated them from the pressures of the modern world. They were healthy because of where they were from and the world they had created for themselves. The medical community had difficulty accepting these findings – no one was accustomed to thinking about health in terms of “location”. When the medical findings were presented, you can imagine the kind of skepticism they faced. Their findings could not be explained by long rows of data or complex charts referring to a kind of gene. Instead, the findings talked about the mysterious and magical benefits of people talking to each other on the street and having three generations under one roof. Conventional wisdom explained a long life by looking at what people ate, how much they exercised, and how effectively they were treated by the medical system. Wolf’s findings required that he convince the medical establishment to think in an entirely new way. You had to look beyond the individual. You had to understand their culture, their friends, their families and what town in Italy their family came from. You had to appreciate their idea of community, their values, and the people with whom they surrounded themselves. And this is what Gladwell tries to explain in his book. You can learn something profound from Outliers. So what can we expect from the world we have been dealt. A world of emails, fax machines, cell phones, instant messages, eating on the run, and enumerable other pressures of modern day society. It certainly does not sound like a formula for death by old age. How appropriate that the simple lesson to be learned by studying Roseto, the outlier, is that we all need to take time to “stop and smell the (Valley of) Roses”. Epilogue: Great-Grandpop Nicola Rosato raised ten children in Roseto before his untimely accidental death while working in the slate mines. The historical society has certified that Nicola was the first of the founders to have built a home followed by Lorenzo Falcone, Giovanni Policelli and Angelo Tedesco. New York Times Best Selling Author, Adriana Trigiani, whose father was born and raised in Roseto, is the author of the book “Queen of the Big Time”, which is based on an annual festival in honor of Our Lady of Mt. Carmel Church in Roseto. Trigiani attended kindergarten at Our Lady of Mt. Carmel. The story of the astonishing results of the Wolf and Bruhn study has been chronicled by many media outlets throughout the world including a segment by 60 Minutes in the late 1960s. Another great column Joe. You are really doing a great service with your writing. It will be appreciated for generations. Funny that I found this site. Nicola Rosato was my Grandfather. I am the child of his youngest daughter named Nancy Anna Rosato-Crisci-Incollingo. My name is Bob Crisci. My Mom was first married to a Phillip Ruggerio from Bangor, PA. They had a daughter named Mary Pyhlles. He died in 1925. My Mom then married my Dad in 1933 and had my brother and sister in 1934 , 1941 and 1944 respectively. My brother and kid sister are still with us. My Aunt Constance, my Mother’s sister married a Joe Stampone, and you are probably related. They had three boys, Joe, Nick and Pete. They are both gone and so is my cousins Joe and Nick. But Petey is still going strong at 80 +. I am 70 years old and my brother is 78 and my sister is 68. I live in Bristol, Pa and My brother lives in New Jersey. My sister lives in S. Carolina. I should mention too that My cousin Nick Stampone had a son named Nick and he has an active law practice in Philadelphia, PA. Lastly, I like to comment about the above story about my Grandfather. The story is very accurate since it’s the same story about my Grandfather that my Mom told to us since we were little. Take care and keep up the good writing. Bob Crisci……. This response is three years late — but better late than never. Your Aunt Constance was my grandmother and I am your cousin Petey’s son. I am actually the lawyer, not my uncle Nick’s son Nicky. My father and mother, Pete and Joan, are still going strong and dad will be 85 on March 20th. Uncle Joe’s wife, Dora (Farrugio) is still living in Bristol and my uncle Nick’s wife Delores is still in Philly. Roseto is a great story and I too am very proud to be part of the history. Hope all is well with you and I will tell my father we were speaking. My brother’s godparents were Nicholas and Theresa Rosato, but they were Uncle Nick and Aunt Terri to us. So exciting to come upon this. I took part in the testing set up by Dr Wolf. I was just a college student volunteer at the testing center. There is increasing evidence for viral infections (especially from enteroviruses) precipitating heart attacks. Enteroviruses are respiratory viruses, which can be caught through kissing or close social contact. The Roseto Italians lived in a traditional close-knit community with probably lower levels of contact with outsiders, and most likely with lower levels of sexual and amorous promiscuity than the average American. This behavior may well have protected the Roseto Italians from picking up viral infections, thereby reducing their heart attack risk. There are around 460,000 fatal heart attacks per year in the US, with 40% of these (184,000 deaths) linked to enterovirus infections (reference here: http://www.ncbi.nlm.nih.gov/pubmed/18061067 ). So any lifestyle that can prevent the spread of enteroviruses in a community will likely result in lower rates of heart attacks. This is not to say that good food and and a supportive family network don’t play a role in reducing heart attacks as well; but the fact is that enteroviral infections are likely the major mechanism of precipitating heart attacks. Not true, though. Roseto is located right against the larger Welsh / German borough of Bangor, with the borough lines crossing right through close-packed neighborhoods. The quarrymen also would have been working alongside men from Bangor and the other nearby boroughs, so it seems likely that any virus that showed up in Bangor would also have showed up in Roseto. That may be the case for very contagious respiratory viruses, like say influenza, which spread easily in the community by ordinary social contact. But less contagious respiratory viruses, or viruses from prior infections that still exist in the body and saliva at low levels (being mostly kept under control by the immune system), may require more intimate contact, such as intimate amorous kissing, in order to spread. Joe-Thank you so much for this information on Roseto PA and it’s clan! Every winter I pull out my Genealogy stash and research part of my clan. This year I’m focusing heavily on my Falcone line. Recently discovered that my Great Grandma Carmella (DeFrank) Falcone’s dad was Nicola DeFrank…who according to some sites helped get Roseto PA incorporated. Have a great day! This is amazing. I stumbled across this while doing a family history project. Nicola Rosato is my great-great grandfather. My name is Nicholas! So proud of my name and my Italian family heritage.